White Moon,Black Moon is the debut album for frostlake, female songstress and instrumentalist. Here is a collection of songs with an eerie strangeness and English ethereal quality, with haunting melodies, layered vocals and unusual sounds. The material is observational and reflective - a door opened into thoughts of nature, love, loss and re-birth, using direct and simple lyrics. The music is awash with atmospheric touches, takes unexpected directions and creates a distinctive soundscape, spanning genres of British psychedelia and electronica. Guitars are used as a framework with individual note picking anchored by lyrical bass patterns and lifted with soaring woodwinds and distant voicings. Frostlake is a singer and multi-instrumentalist whose real name I don’t know, though I see in the promo sheet that she is also part of Orchestra Of The Upper Atmosphere, who released the outstanding 02 set that I reviewed earlier this year. Frostlake plays electric and acoustic guitars, viola, synth, electric piano and electronics, with assistance from other musicians on bass, flute, synth, piano, clarinet, glockenspiel, drums and various forms of percussion. The dozen songs on White Moon, Black Moon are singer-songwriter Folk-Prog at their core, through with a beautifully dreamy Psychedelic and Space-Ambient quality. Throughout the set I was impressed with the way ambience, effects and field recordings are deployed, being a powerful presence or embellishment, but always contributing to the larger picture that is being painted. I like the spacey atmospherics and effects, ambient bass and Celtic quality on No Looking Back. Similarly, the bass clarinet adds a dreamy ambient flavor to Night Watch. The accordion does the same for Quiet Storm. And ditto for the E-bow on the title track, plus slide guitar which injects a spaced out Dave Gilmour feel. Songs like Snowlight, that seem instrumentally sparse, actually speak volumes with their spectral moodiness and cautious but effective use of percussive effects and melodic ambience. Falling Through Shadows has a dreamily eerie Psychedelic orchestral Folk flavor that I enjoyed. I like the drifting, cosmic jazzy feel of Connection. Dark Winds and Endless Rain struck me as Space-Ambient takes on the Trespass era Genesis sound. And Thin Red Line is similar but with the bonus of some of the most exquisite compositional/instrumental arrangements of the set. Beautiful ...atmospheric ...ethereal ...spooky! This short collection of adjectives straightaway characterizes this unusual album. frostlake is apparently the stage name of singer and multi-instrumentalist Jan Todd, currently also part of Orchestra of The Upper Atmosphere (and married to it's bassist, Terry Todd). Todd plays mostly electric guitars and electronics, sometimes viola, percussion and electric piano. 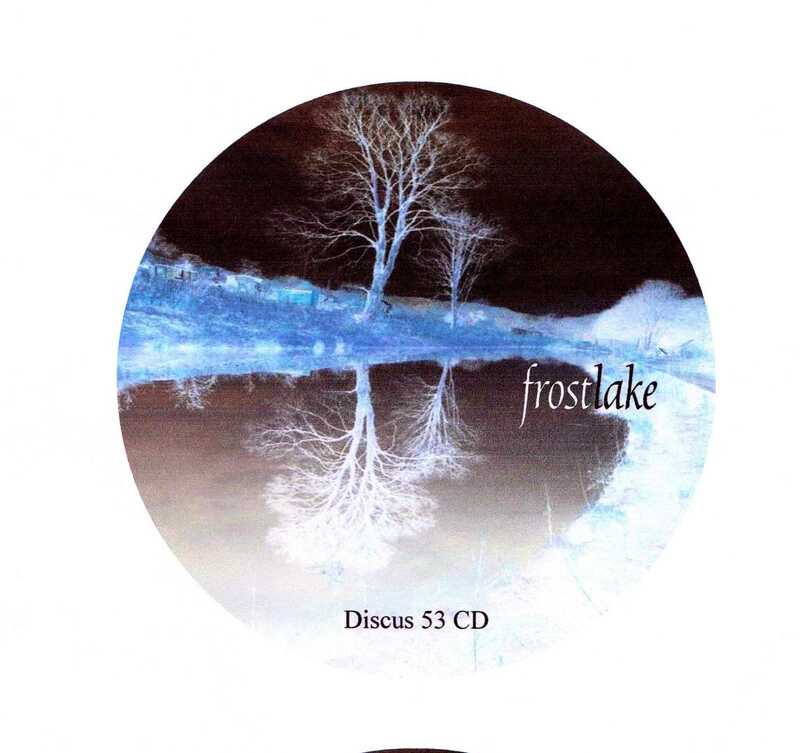 Then there are occasional contributions by guest musicians (often sounds of wind instruments) but frostlake's voice is at the centre of the music - gentle, almost breathy sounds, her voice sometimes layered and multi-tracked, gliding through electronic clouds, restrained echoing guitar lines, subtle percussive patterns and cautious Bass washes. 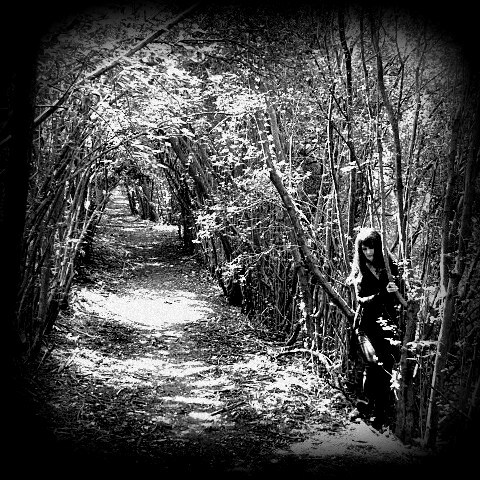 Dreamlike and chilly is the world inhabited by frostlake, the mysterious songstress whose name graces the b&w album artwork of White Moon, Black Moon. The gnarled branches of its trees have long since shed their leaves; the trails and roads are blanketed with snow. The singer’s breathy vocals draw listeners into this alien land — they are a soothing invitation while at the same time calmly urging patience and caution. Recorded in Sheffield, UK and released by Discus Music, White Moon, Black Moon represents the solo debut of multi-instrumentalist, vocalist and songwriter frostlake. Her association with the Orchestra Of The Upper Atmosphere, with whom she also performs and records, plants her firmly at the crossroads of the rustically traditional and the cosmically spiritual. Indeed, members of that space-rock collective — including husband Terry Todd on bass — make appearances throughout the album. Nevertheless, this ethereal landscape is singularly the beautiful and icy domain of the singer/songwriter. The path into twilight flows through “Black Winter,” whose ringing, meditative guitar creates the atmosphere above which frostlake’s voice floats like a layer of clouds. Her vocals seem to percolate and weave through the arpeggiated chords, strings, and electronic augmentation. The darkly beautiful ”No Looking Back” zigs a different zag: here the wispy vocals seem to encircle themselves out of contempt for the deep synthesizer. When coupled with acoustic bass and drums, it creates a cold, eerily inorganic rhythm. Descending further into this world, an elegant if eerie calm encompasses the listener, not unlike a warm blanket under which one is aware but does not feel the chill of a lightly falling snow. “Dark Winds,” for example, seems foreshadowing and ominous, yet the singer’s vocals never seem urgent or alarmed. Rather those elements present themselves in the background, bubbling to coalesce with the soothing vocal melody: the viola, the synth, or the sparingly used E-bow. Perhaps what makes White Moon, Black Moon one of the more unique psych-folk releases of the year — and indeed what may be the album’s biggest success — is the way in which frostlake arranges and blends a seemingly disparate array of instruments. The way in which flutes, keyboards and slide guitars blend does indeed amount to a small orchestra which, although at times subdued, helps to build those airy layers upon which the essence of these songs rest. Martin Archer's Sheffield-based Discus Records is a home for the wilfully strange, and the occasionally unfathomable, but with frostlake the label presents its most conventional face yet. 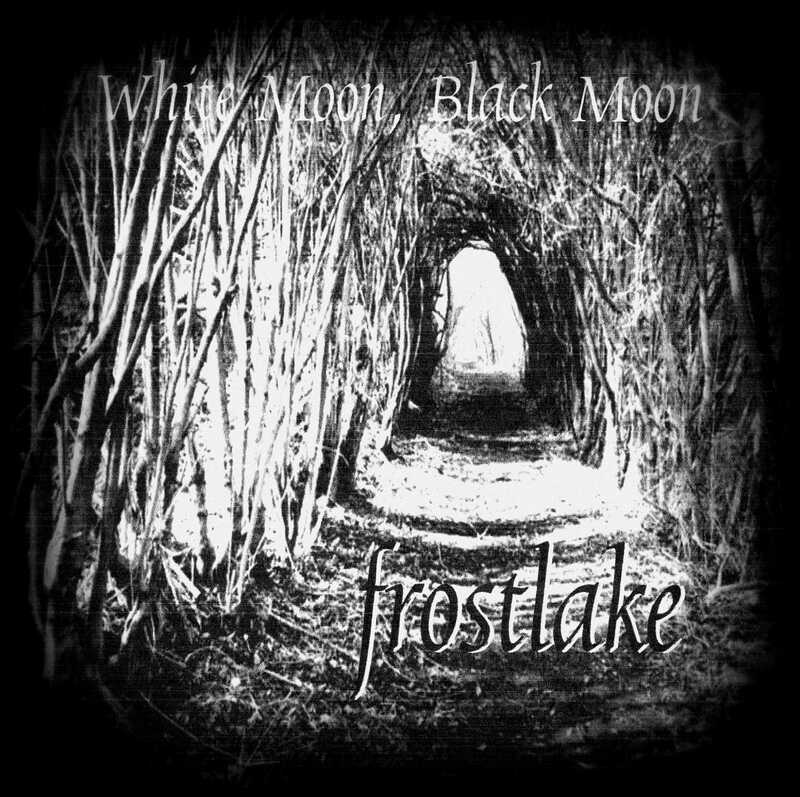 frostlake - the lower case "f" is deliberate - is a mysterious pagan goddess who weaves hymns to winter spun from the crystalline mists of the dark months on her debut album White Moon, Black Moon. She is also a member of Discus acts Juxtavoices, and Orchestra Of The Upper Atmosphere, the former an enticing "anti-choir", the latter a magnificent improvising cosmic rock beast. On her solo album and left to its own devices her muse crafts delicate but dense psych-folk, in so doing highlighting her many and varied talents, showing that she is not content to be pigeonholed into one genre. This introspective and beautiful album stirs into life with Black Winter swooping across the still land, a song sung from the perspective of a bird in flight, frostlake's picked guitar and echoey atmosphere forming the background for Nigel Manning's flute which becomes the airborne avian, carried aloft on frostlake's multi-tracked harmonic choir. The restless protagonist of No Looking Back seeks escape, driving her car far beyond the originally intended destination to "...leave this madness behind, follow a road that has clearer signs". Haven't we all thought that way at one time or another? The muffled stillness of snowfall, the contemplative effects of moonlight in a dark room, the hypnotic power of Dark Winds made moan, all this and more marries the natural phenomena of the dark months with its power to turn us towards the introspective side of our psyches. The warmth of this record is an aural equivalent of curling up by a roaring fire while outside one of those strangely calm winter snowstorms blankets everything in white inertia. In addition to painting the eternal English winter canvas, there are human songs in here, too. Connection bemoans the surplus nervous chit chat that fills all the gaps, because there's nothing to say, really, no common ground. Judicious use of a chorus pedal on the electric guitar and minimal Korg piano combine to produce a forlorn atmosphere redolent of Nick Drake. Quiet Storm is a tale of darkness rising, like a river soon to burst its banks, with subtle use of accordion and field recording over the plucked strings, painting a melancholy picture.The never ending wet grey of English winter is perfectly described in Endless Rain, frostlake gently bemoaning "Where do birds go to hide from rain, think I'll join them in their waiting game", while cyclical arpeggios gently tinkle away, and the subtle addition of clarinet in counter melody is a nice touch. Wunderschön ... atmosphärisch ... ätherisch ... gespenstisch! Diese kurze Sammlung von Adjektiven gleich vorweg als Kurzcharakterisierung dieses ungewöhnlichen Albums. frostlake ist offenbar der Künstlername der Sängerin und multiinstrumental veranlagten Klangbastlerin Jan Todd die derzeit auch Teil des Orchestra of the Upper Atmosphere ist (mit dessen Bassisten Terry Todd sie zudem verheiratet ist). Mit "White Moon, Black Moon" erschien 2015 ihr hier zu rezensierendes Solodebüt auf Martin Archers Discus Label. Elektronisches und E-Gitarre bedient Todd hier meist, bisweilen ergänzt um Viola, Perkussives und E-Piano. Dazu kommen die gelegentlichen Beiträge der Gastmusiker (oft Klänge von Blasinstrumenten). Im Zentrum der Musik steht aber frostlakes Gesang. Sanft, fast gehaucht erklingt ihre Stimme, mitunter mehrspurig übereinander geschichtet, eingebettet in verhalten dahin gleitende elektronische Wolken, zurückhaltend hallende E-Gitarrenlinien, dezente perkussive Muster und vorsichtige Basstupfer. Allerlei Klänge, elektronische Geflechte und Geräusche umwabern die Musik zudem und sorgen mit diversen Effektverfremdungen für eine eigenartige, anderweltige Atmosphäre. Nicht selten sorgen Flöten bzw. Klarinetten für weitere Klangfarben. Die Britin Jan Todd war bereits bei dem Bandprojekt ORCHESTRA OF THE UPPER ATMOSPHERE von Martin Archer beteiligt, der ebenfalls Betreiber des kleinen Discus Labels ist. Sie ist jedoch nicht nur Singer/ Songwriterin, sondern hat als Multi-Instrumentalistin das gesamte Material geschrieben und aufgenommen. Zudem ist sie bei Martin Archers Anti-Chor-Projekt JUXTAVOICES und Bo Mesons Improvisions-Band MESON aktiv. Unter ihrem Künstlernamen erscheint nun ihr Debütalbum ´White Moon, Black Moon´. Als FROSTLAKE begibt sie sich auf leisen Sohlen in die Tiefen des Waldes. Ihr Folk Rock tanzt dabei nicht blümerant unter strahlend blauem Himmel über vom Tau benetzte Wiesen, denn sie kämpft sich verzweifelt durch widerhakenreiches Gestrüpp im nebelverhangenen Finsterwald. Mit einigen Elektronika und E-Gitarre bewaffnet, schlängelt sich FROSTLAKE durch die Wildnis. Mit Hilfe von allerlei Blasinstrumenten, vor allem Flöte und Klarinette, entsteht eine finstere Atmosphäre, der jegliche Freude abhanden gekommen zu scheint. Die Lieder verströmen dabei eine geradezu ätherische Stimmung. Insbesondere sollten hier ´Night Watch´, über dem blubbernden Moor wandernd, ´No Looking Back´, mit SOAP & SKIN-Atmosphäre, ´Connection´, Wolken-Kammerrock, und ´Thin Red Line´ als besonders prägnante Vorzeigeexemplare genannt werden. Vielleicht tänzelt FROSTLAKE aber auch einfach nur als Engel über den Wolken in den federleichten, luftigen Klängen von KING CRIMSON herum. White Moon, Black Moon is the debut album from frostlake (aka Jan Todd), a songstress and multi-instrumentalist who might better be described as an enchantress, given the haunting quality of her songs. Issued on Discus Music (founded by Martin Archer and Mick Beck in 1994) and recorded at FrogPond in Sheffield, the twelve-song set calls to mind the pastoral folk-prog era of the ‘70s but infused with an eerie, even cryptic edge. Hers is a very English-sounding music that's lo-fi, atmospheric, and tinged with psychedelia, and that dark woodland depicted on the cover serves as an apt metaphor for the project's subtly macabre tone, one that on its surface seems congenial enough but hints at a darker undertow within. Todd herself is credited with voice, guitars, electronics, viola, accordion, keyboards, and percussion (one song even credits her with llama's toenails), and is joined by a solid group of Sheffield musicians on the recording. Certain elements give the album its defining character, among them the woodwinds of Nigel Manning (flute), Martin Archer (clarinets), and Mick Somerset (bass clarinet, bass flute, bass recorder) and a rich percussive soundworld that includes handheld sleigh bells, gong, thunder box, temple bells, wind chimes, and knitting needles. The element that most defines the frostlake sound, however, is Todd's hushed voice, which appears on all twelve tracks and, depending on the song, could conceivably invite comparison to Julee Cruise, Grouper, or Marissa Nadler. In keeping with the sound design, her lyrics are poetic and evocative and have strong ties to the natural world (e.g., “Wait in the dark, turn out the light, let the moon light up the room / Where the shadows are falling in line with the thoughts left behind”). If there is one thing that you can anticipate from the releases on the Discus label, it’s to expect the unexpected. This is a case in point. frostlake is Sheffield-based singer, musician Jan Todd. On this debut release (White Moon, Black Moon), she creates layers of her voice and multiple instruments alongside contributions from other fine folks from the area including Martin Archer, Charlie Collins, Terry Todd and others. The first thing that strikes you is the reverb-drenched near-whisper vocals. These are combined with layers of dreamy instrumentation that evokes a folky, psychedelic, progressive soundscape. It almost feels like one of those unearthed rarities of what is now termed “acid folk” recorded in the late ’60s or early ’70s.